Verasia blocked the downward swing with ease. She looked at her opponent and deliberately held her light saber against her attackers and let them arc and sizzle. She spun and in one swift motion unclasped her cloak and still spinning threw it in her attackers face covering it. Her adversary cursed and pulled the cloak from her head. Verasia had her light saber pointed at her opponent and she was defeated. “No fair.” protested Mykala. “That’s dirty fighting.” she said smiling. “Do you think your attackers will follow the rules in real combat?” Verasia replied. Mykala just shook her head in agreement. They had been practicing all morning and were ready for a break. Mykala handed Verasia back her cloak. They both noticed the hole in it from Mykala’s light saber. “ I’ll sew that up for you master.” Mykala said grinning. “At least she killed the cloak.” Verasia thought. “Would you like to get something to eat?” Mykala asked. “No, I have a class to teach momentarily, you go ahead.” Verasia said. Mykala bowed and walked down the hallway towards the dining hall. She liked it here at Verasia’s home. Maxis Ty was wise to hide her here. It was a place deep in Feloid space and were Verasia taught Feloids how to fight like a Jedi. The Feloids can never be Jedi’s because they can not have any loyalties that supersede their own race and clans. Mykala hurried to her quarters and showered. She put on a simple tunic and long dress that was normal for most Feloid women to wear this time of year. Although she was human she felt she should try to fit in as much as possible. She laced up her knee high sandals and looked at herself in the mirror. She saw her catgirl servant Poe standing behind her in the reflection. Poe smiled at Mykala. She knew the real reason Mykala was trying to fit in. It was because of Araya. Araya was a distant cousin of Lionettes that was here training with Verasia. He was a high born royal much like Lionette and he was training to be a warrior. He was one of the first Feloids to befriend Mykala at the house. He said he felt it was his duty to help her because she was under the clan’s protection but Mykala sensed it was more than that. Ever since they were first introduced they had a connection. 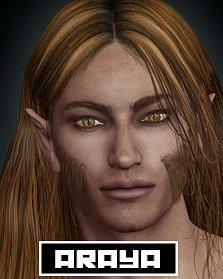 He was big like most Feloid males and had long thick blonde hair. He was always polite and never made fun of Mykala because of her past. Mykala always felt less worthy than the other royals. It was true Mykala was the queen of her home world but she was raised in the streets of a war torn world. She didn’t remember her parents and received her learning from various gangs that she ran with for protection. She had been a mercenary and a gun for hire until she signed on with Stella and the rest. It was through a strange series of events that she found out her mother was the last queen of their world and had fled after an uprising. Her mother and the rest of the refuges were killed by the gangs on their new home leaving Mykala an orphan in the streets. Recently she had been training how to be more lady like so she would fit in better when she returned to free her people. She was constantly on guard not to do or say something incorrectly that would make her look foolish. Araya would always smile and correct her as his way of helping her. He never looked down on her or treated her as second class. That was very rare for Feloids to do to anyone not a Feloid. Mykala looked back at Poe. “Well, how do I look?” she said concerned. Poe went too the dressing table and picked up a broach. She went over to Mykala and pinned it to her tunic. “Now you are ready mistress.” she said looking down. Mykala lifted Poe’s chin so their eyes met.”Thank you Poe.” Mykala felt uneasy having a slave. It was a Feloid tradition and she was stuck with it while she was under their protection. “Thank you mistress.” said Poe. She lightly ran to the door to hold it open for Mykala. Mykala left and hurried to the dining hall. She nodded as she passed several other students. They were polite to her but it was still quite obvious that she was considered an outsider. Mykala sighed in disappointment as she entered the dining hall. Araya was not there. She must have missed him. She would have to eat alone again. She went to the table she usually sat at by the big window. From there she could enjoy the sunsets. There were no real sunsets where she was from. There was always something burning that would blacken the sky. Here it was different, it was always peaceful and relaxing. It took her several sleepless nights to get used to the quiet. There was no shell fire or screaming, only song birds. “May I sit here?” came a deep masculine voice. It was Araya, he was smiling as he looked down at Mykala. “Yes you may good sir.” Mykala was enjoying herself for the first time in her life. Her life had always been hard as long as she could remember. She had to fight to survive every day just to find food and water. Mykala had killed her first man at age twelve in a knife fight. Here everything was different. Everything was clean and organized. It was quiet and the air was sweet. Even though they taught fighting here they also taught students how to relax and find inner peace. There was also Araya, big strong and kind. He had class that went beyond wealth and power. He respected others regardless of who they were. He even allowed his slaves a day off to follow their own interests. One had even become quiet a fine musician. This slave would often play alone down by the lake in the evening so she could be heard by everyone. “I have just come from the security office and have some interesting news.”he said as he sat down next to her. should be spectacular to watch.” Araya said. “That sounds like that would be wonderful to watch.” Mykala said. Araya took Mykala’s hand.” I thought it would be nice if we watched it together.” he said looking into her eyes. Mykala’s heart began pumping harder and she could feel her face turning red. “I would like that very much Araya.”she said hoping he didn’t notice her voice crack. “We shall meet down by the lake at the old tower. I’ll bring some wine to celebrate the comet being kind enough to give us this wonderful show.” He said smiling. “Mykala gonna git sum !” she thought to herself. She couldn’t help it. As hard as she tried sometimes the old ganger girl still popped up in her head. “That will be wonderful, I can hardly wait.” she said aloud. “Excellent!” Araya said grinning from ear to ear. “We shall meet at the new gate after they turn the lights out.” he said as he stood up. “I’m so glad we’ll watch it together. I must be off now to attend my classes. So until tomorrow night then.” he said and walked away. Mykala wanted to get up and do a victory dance right there but she held her composier. Mykala had never had what you would call “a boy friend”, she had been with men but never one she thought of that way. On the world she came from people would find whatever pleasure or companionship they could. They could never count on any long term commitments because nobody new if they would be alive the next day or not. Most times men and women got together it was after a lot of drinking or after a battle when the blood was still up. Mykala ordered her meal and sat watching the young Feloids in the room. They were polite to her but for the most part they just ignored her. The high born Feloids were very prejudiced against other races. They had been taught that they are the best at everything. Luckily they were also taught to tolerate others and to be polite. Unlike the Empire that was strictly pro-human at least the Feloids believed in a live and let live belief system. Feloids are warriors but tend to only fight amongst themselves. It is in their nature to try to dominate one another. They have a code of honor that allows vendettas and duels to exist under a set of rules they have fine tuned over the centuries that keep bloodshed to a minimum. Mykala ate her meal in silence while she enjoyed the sunset. As she looked out of the window down toward the lake she saw Verasia standing at the boat dock. It looked like she was watching the sky. She just stood there looking up the whole time Mykala ate her meal. It was as though she was looking for something in the darkness of space itself. For some reason Mykala became frightened. It was as if she was being sucked down into a dark pit never to be free again. A chill ran down her spine and she actually shook her body because it felt so real. She stood up and walked out of the dining hall and outside onto the balcony that overlooked the lake. She could see Verasia still standing there looking up. Mykala hurried over to the long stone stairway that lead down to the lake and went down. She could still see Verasia standing at the boat dock . She walked calmly over to her and stood beside her. “Master, are you feeling alright?” Mykala asked quietly. Verasia seemed not to notice her at first. She slowly, as if in a trance turned to Mykala. “Yes dear, I’m fine.” she said. She looked deep into Mykala’s eyes for a moment . “Are you feeling alright Mykala?” asked Verasia. “Well master, I was sitting in the dining hall just a moment ago when I noticed you down here by the lake staring up into space. Suddenly I had a terrible feeling of dread come over me. I was frightened by something, something very dark and relenting in it’s pursuit of evil.” Mykala said as she too began to watch the night sky. “I too felt this disturbance. Mykala there is something going on here that has me worried. We have had no communication with the House of Ty for three days now. They security forces say it is because of interference from the comet but I feel there is something else. I sense a…presence. There is an great evil circling us as we speak.” Verasia said as she took Mykala’s hand. “I think we should leave this place.” Verasia said. Her tone was one of indecision. She truly wasn’t sure what the best course would be. Mykala immediately thought of Araya and tomorrow night. “There isn’t any reason to worry without cause. We are deep inside Feloid space under the protection of a clan lord and his fleet. I suggest we wait until we have a better understanding of what we have felt before we plan to do anything.”said Mykala. She was allowing her own judgment to be clouded by her desires but she didn’t care. She deserved one night of pleasure after all she’d been through. “Perhaps you’re right Mykala, it would be impossible to be attacked here.” Verasia said. “However that is what makes me nervous. Just because something can’t happen doesn’t mean it won’t.” she added smiling. “Why don’t we wait til morning to decide, we should have a better feeling for things then.” Mykala said hoping to stall one more day. “I guess you’re right, we should at least wait until we hear from the House of Ty or one of Lionette’s couriers.” Verasia said. They stood watching the night sky a while longer. Mykala felt badly about putting her own interests ahead of everything else. However there really wasn’t anything to worry about way out here this far into Feloid space. What could go wrong? The next day Mykala was surprised to find out that Verasia had canceled her classes. She had decided to take a ship and go to the home world of the Ty clan to find out why they hadn’t heard from them. Mykala was bothered by this development but she would not worry about it until she knew more. This was the first time she had a day off for weeks just to do what she wanted to do. Mykala and Poe went to the village a short way from the house. Mykala wanted everything to be just right for that evening. Poe took her to a spa that she new of and had the catgirls there give Mykala the royal treatment. At first Mykala refused until she made Poe join her. The catgirls did a wonderful job and the two were treated like they owned the spa. It was getting late and Mykala sent Poe back to her room. Mykala spent the rest of the day going about the school grounds in hopes of running into Araya. It was now diner time and Mykala decided to go to the dining hall. Mykala had watched the sunset from the dining hall alone as usual. Araya had not shown up for diner. It was strange that she hadn’t seen him all day. They would usually run into each other at least once a day during their duties. Maybe the others had found out about them getting together that evening. He might be having second thoughts about getting so close to her. It would be horrible if she went to the lake tonight and he never showed up. The other Feloids might convince him that it was improper to be with her. No, he wasn’t like that. Something must be keeping him busy. Maybe he had some bad news from his home. Perhaps a family emergency or something. “I’ll kill him.” Mykala thought to herself. “How dare he stand me up. I’m just as good as any of those Feloid women that always flirt with him.” Mykala thought to herself. “Mistress, master Araya stopped by your quarters and left something for you.” it was Poe Mykala’s catgirl servant. She was holding a small box in her hands. She had come all the way from Mykala’s room to give it to her. Mykala looked at the box in disgust. It was most likely a note explaining why he couldn’t make it tonight. Mykala snatched the box angrily from Poe. She should just throw it away instead of reading his lies. She hesitated for a moment until her curiosity got the better of her, she opened it. Inside was a note that apologized for being to busy to see her today. It said he had spent his day in the woods looking for a certain type of flower that Mykala had mentioned she liked. In the bottom of the box was that very flower. “I new he wouldn’t stand me up!”Mykala said aloud and gave Poe a big hug. “ Poe we need to get back to my quarters, I need to get ready for tonight.” Mykala took Poe by the hand and practically drug her down hallway. Mykala was happy again. It may seem strange to others but this was her first normal date with a man. The type of date that happens millions of times a day across the galaxy. The type of date that she only dreamed of growing up. A simple boy and girl date without gunfire or explosions. Poe was happy too. Mykala had always treated her with kindness and compassion. She would never want Poe to do anything for her. She had told Poe just to sit back and relax for the time she was under Mykala. This of coarse would not due. Poe did even more for Mykala because of her kindness towards her. They had become very close over the past months. Back at Mykala’s quarters the two were frantically going through clothes for Mykala to wear tonight. “Mistress, may I speak freely?” Poe asked hesitantly. “I was wondering, how much you…liked…master Araya? Poe said. She was definitely getting at something. “ I like him very much Poe, just what are you getting at? Mykala was still distracted. She was holding up dresses in front of the mirror. She wanted to see which one would look best. “If you can, you should run you fingers through his hair behind his ears.”Poe turned away embarrassed. “Run my fingers through his hair behind his ears? Why would I do that?” Mykala was now interested in what Poe was saying. “Well if you want him to know you like him then you should do that so he knows it’s alright to like you back. He would want you to do that if you want him to like you tonight.” Poe was telling Mykala the Feloid way of letting a male know he could have her. “Oh, I see.” Mykala finally got it. She smiled at Poe who still looked a little unsure of what she said was okay with Mykala. Mykala smiled at Poe. “Well thank you Poe, if that works I’ll be sure to let you know if we liked our brains out.” Mykala and Poe burst out laughing. Poe peeked out from behind the hedge row, she saw a large well dressed male waiting at the head of the path that lead down to the new gate. “He’s there mistress.” Poe said as she ducked back behind the plants. “Are you sure it’s him?” Mykala said nervously. “Yes my mistress, now go.” with that said Poe gave Mykala a gentile push and out she stepped onto the path. She waited a second and then walked towards the lake as nonchalantly as she could until Araya turned and saw her. His face lit up with joy. She could see genuine happiness on his face. She felt wonderful. This wonderful man was happy to see her. Her, the dirty little ganger girl that had slept in sewers and had eaten a rat or two in her youth. This kind and gentile man wanted to be with her. “I’m so glad you came.” Araya said as he hurried up the path to meet her. He took both her hands and kissed her on the cheek. “ I’m looking forward to the big show, I mean the comet of course.” Mykala stammered. She was as nervous as a youngling. Of all the places she had been and things she had done nothing could compare to this night. Even mercenaries fantasies about a handsome prince and moonlight walks in a garden. They walked for awhile holding hands enjoying the night air. It was summer time here and there was a cool breeze blowing in from across the lake. There was a sudden cry from the main building and they both turned to see what it was. It was the comet. It had suddenly appeared from behind a huge cloud that had been threatening rain all evening. They couldn’t believe how close it actually was. Bits of ice and debris were flying off in all directions like fireworks. “Hurry, let’s get to the tower for a better view.” Araya said. He held on to Mykala’s hand and started to run. Mykala ran with him as fast as she could laughing all the way. They reached the tower in just a few minutes. Mykala looked up and saw a dim glow in the upper floor window. When she asked Araya about it he just smiled. “It’s a surprise.” he said. They both ran to the top of the stairs and into the upper most room. There inside was the most beautiful sight Mykala had ever seen. In the room there were hundreds of tiny candles burning. They had been placed on the floor and the shelves, almost every flat surface had a tiny group of candles on it. They gave off a dim warm glow that made the dusty old tower room look magical. It must have taken hours for Araya to set this up. On the table in the middle of the room was a bottle of wine and two glasses. Mykala put her hand over her mouth in disbelief. No one had ever done anything like this for her before. She felt her eyes begin to fill with tears and threw her arms around Araya. “Thank you, thank you Araya, it’s beautiful.” Mykala sobbed into his shoulder. “What is it?”Araya asked. He was a little surprised by Mykala crying. “It’s wonderful, it’s all so beautiful, no one has ever treated me this way before.” she said as she gained he composier. Araya lead her to the table and held the chair for her. Mykala felt some what silly at her earlier display. He poured them both some wine and touched her glass with his. “To a wonderful evening and a wonderful woman.”Araya held up his drink and quickly drank the whole thing down. “Thank you.” Mykala said as she took a sip. Araya poured himself another glass. “We will have a much better view from up on the tower landing.” he said motioning for Mykala to follow him. They both climbed the last flight of stairs to the top. From there they could see the entire lake and the great house. Araya stood next to Mykala and put his arm around her waist pulling her close to him. She rested her head on his chest and looked skyward at the comet. It was truly a beautiful sight. It was showering huge pieces of ice across the sky catching the light from the moon. “Oh look some of the pieces are hitting the atmosphere!” Mykala said as she watched. “It pales in comparison to you Mykala.” and saying that Araya threw his strong arms around Mykala and kissed her full on the lips. Mykala put her arms around him and kissed him back hard. Her head was swimming with pleasure. The comet didn’t matter at all any more. The only thing in the entire galaxy to her was Araya they kissed passionately for several more minutes until Mykala couldn’t stand it anymore. She slipped her hands up behind his ears and started to scratch him there seductively. Poe’s advise was good. Araya growled and picked Mykala up and cradled her in his arms in one fluid movement. Mykala scratched harder as she felt him become aroused. Araya carried Mykala back down stairs and into the room with the candles. He knelt and gently lay her on the carpet. The summer sunlight was coming through the window. It was a cool morning, Mykala and Araya were on the carpet in each others arms. It had been a night of incredible passion for both of them and neither wanted to get up from their embrace. “Mistress, mistress?” came a small voice from the stair well below. It was Poe. She had secretly spent the entire night outside the tower to make sure they wouldn’t be disturbed. “Mistress it is time to leave, forgive me but you must get ready for the day.”Poe said quietly still down on the stair well. Mykala lay on the floor looking into Araya’s eyes. They were so different than her own. Large and golden in color. The same eyes were looking back at her’s. “You must go.”he said and smiled. “ You can come up Poe, it’s okay.” Mykala said getting to her knees. Araya had already put on his pants and was brushing off his shirt. There was a small thump sound in the stair well. “Poe, I said you can come up.” Mykala said a little louder. There was no answer. Mykala looked at Araya just as he looked at her. Something was wrong. Mykala felt the same sickening fear rip through her that she felt when she saw Verasia standing on the docks. “Poe! Poe, are you alright?” Mykayla was on her feet pulling on her clothes as fast as she could. There came the sound of a light saber turning on and then a second. They could hear foot steps coming up the stairs now. They both realized they didn’t have their weapons with them, they were trapped. Suddenly there was the whirring hum of some body twirling their light sabers. Mykala’s eyes went wide as she realized she had been found. The woman slowly walked into the room spinning her light sabers as she always did before a battle, it was Lyda Starkiller. The comet! Somehow she had used the comet as cover to sneak onto the planet. Behind her came her two Zabrack body guards. One was holding Poe with his hand over her mouth. “I’ve been looking for you Mykala, you’re a hard one to find.” Lyda said as if they were all old friends. Mykala’s heart sank, even if she had her light saber she was no match for Lyda. Instinctively Araya stood in front of Mykala. He had known of Mykala’s troubles from his cousin Lionette and had been asked to help keep her safe. “Oh even better, a boy friend. We won’t need the slave after all.” Lyda said to the Zabrack holding Poe. Before Mykala could beg Lyda the Zabrack broke Poe’s neck and let her drop to the floor with a thud. “No!” Mykala cried reaching out her arms to Poe as Araya held her back. “Shhh” said Lyda putting her finger to her mouth. Mykala controlled her sorrow as best she could. She knew she must do whatever Lyda said . Araya’s life was now in the balance. Mykala understood Lyda would kill Araya before herself as to add to her agony. “I will do what ever you want but please don’t hurt anyone else.” Mykala begged. “Do not beg! I do not want you to beg!”Lyda shouted. “You will do what I say because I have given you no choice in the matter. You cannot beat me in a fight. I have you and your man at my will. There is no hope for you.”Lyda said grinning now. She had put her light sabers away and walked over too Araya and Mykala. “ You are a handsome man. Tell me, do you know you will die today? Mykala will do nothing to try to stop this from happening because of fear. She fears me to her core. She knows the only chance of you living from second to second is the fact that I want her to feel fear. If I killed you now she would feel anger and sorrow. I want her to feel fear. The fear that she may say or do something that will cause me to kill you.” Lyda said. Lyda pressed her body against Araya. She began to caress his chest. Did you know Mykala can’t die. Isn’t that a remarkable thing? If anyone were to strike her down she would teleport to a safe place somewhere in the galaxy. So how does one defeat an enemy like that? She could attack me right now and if I killed her she would just reappear some where else safe and sound. She could keep trying for years until I slipped up and she killed me. Well I can’t have that you see. I will keep you with me. I sense a bond between you two. A bond too strong for her to sever. It is love. She loves you handsome man. She will not do anything to cause me to harm you. “That leaves me with only one choice.”Araya said. W ithout hesitation Araya grabbed one of Lyda’s light sabers and stabbed Mykala in the heart.